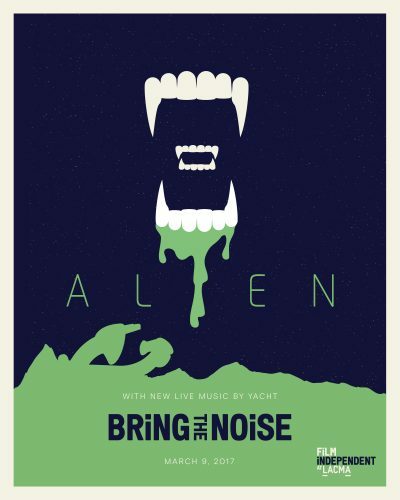 “I Thought the Future Would be Cooler,” isn’t just the name of March 9 Bring the Noise guest composers YACHT’s most popular song—it’s also a sentiment with which the hardscrabble crew of the commercial spacecraft Nostromo would undoubtedly agree. Ridley Scott’s classic 1979 sci-fi horror flick Alien introduced the world to a grubby, blue-collar vision of the future in which the Nostromo’s crew (Sigourney Weaver’s iconic Ellen Ripley) were far more concerned with cashing their paychecks than exploring the stars. At least until the accidental discovery of a carnivorous xenomorph introduces an even more pressing priority: survival. Each new edition of Bring the Noise, which kicked off last month with a screening of Todd Solondz’s Welcome to the Dollhouse scored by Seth Bogart, is set to feature an original, one-night-only performance of a live score to a classic film selected by that month’s guest composer. Future guest composers are slated to include Bleachers’ Jack Antonoff, Warpaint’s Emily Kokal, Nick Zinner of the Yeah Yeah Yeahs and more. For more information, including how to buy tickets, check out our website. So tell me how you guys got involved with Bring the Noise and why you picked Ridley Scott’s Alien. Bechtolt: We’ve done a handful of live scoring things before, but never for a feature or [for a] known movies. It’s been short film programs or comedy or stuff like that. But this is a real challenge that we’re excited to tackle. Evans: When we were asked, we said yes right away. We love doing things that are outside of our [wheelhouse]. And something that’s unique and only happens once is exciting. There’s a lot of tension and a lot of pressure. When we got the opportunity to do this, we knew we wanted to do a classic science fiction movie. Considering the moment of time in which we live, I think Alien is a really strong contender. It’s about female strength in the face of unspeakable evil and dominating that unspeakable monstrosity through a combination of strength and vulnerability, which is exactly what we need right now. 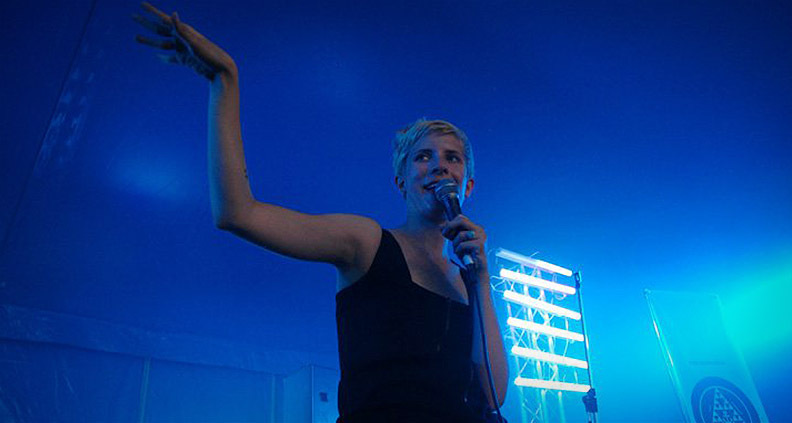 How has science fiction influenced the music of YACHT? Evans: It’s difficult to quantify. I think that [we have] just a general interest in possibility and imagination—that’s something that has always really driven us, thinking about the future, trying to reconcile our present condition with previous generations’ imagination of the future. How would you describe the music of YACHT in general? Bechtolt: Since we’ve been a band for so long, I feel everything we do is all over the place. We have six records and none of them sound like each other. Evans: [YACHT] has been a one-man laptop band, it’s been a five-piece family band, it’s been an avant-garde video art performance troupe. It really has been a bit of everything. We came up in sort of DIY and punk scenes in the Northwest, and we’re also really into computers. It’s like a wonky DIY approach to high-tech music. Who are some of your favorite film composers? Kieswetter: I think collectively John Carpenter has been a subconscious influence on us, so if that influence seeps it’s way into [our Alien score] it’d be a happy accident. Evans: Is it embarrassing to say that I really love the Daft Punk score for Tron: Legacy? It’s one of my favorites. I like it when a movie has music that’s not afraid to have personality. I’m also thinking of Vangelis’s Blade Runner score, which is almost camp. I think the Stranger Things music is great. It’s exactly on the nose for what it should be. What’s been your process for composing Thursday’s live score? Kieswetter: I think we’re using the influence of the instruments of YACHT, or the utensils. The pallet is being informed by the gear that we have, not necessarily any one composer or artist, more so just the pallet we work with. Bechtolt: Analogue synthesizers are some of the utensils we use; classic drum machines. We’re really just restricting our pallet to sounds that we’ve used before and love. What’s been the biggest challenge with this project? Bechtolt: I think the biggest challenge to doing something like this are the expectations. People know this movie and love this movie and I don’t want to screw up the experience for them. But I think we’re doing a good job. Evans: I think the sound design in the film is almost better than the score. There are actually so many parts in the film where we’re listening to it and we can’t actually tell if it’s music or sound design. Some of the most iconic scenes don’t have music. A lot of the creeping around the ship and alien stuff is total silence and breath. We don’t want to go over the top. So it’ll be about knowing when to hold back, too. Excited yet? If so, put on your space helmet, watch out for facehuggers and click here for more information about Bring the Noise. Individual tickets are $20 for Film Independent and LACMA Film Club Members and $25 for LACMA Members, students with valid ID and seniors 65+. General public can snag tickets for $30 apiece. Film Independent at LACMA’s Bring the Noise program is brought to you by Premier Sponsor Audi, Lead Sponsor Hollywood Foreign Press Association and Promotional Supporter KCRW 89.9FM.